Nationality: Belgian. Born: Brussels, June 1950. Education: INSAS film school, Brussels, 1967–68; studied at Université Internationale du Théâtre, Paris, 1968–69. Career: Saute ma vie entered in Oberhausen festival, 1971; lived in New York, 1972; returned to France, 1973. Les Rendez-vous d'Anna , Paris, 1978. Bordering on Fiction: Chantal Akerman's D'Est , New York, 1995. Interview with C. Alemann and H. Hurst, in Frauen und Film (Berlin), March 1976. Interview with Danièle Dubroux, and others, in Cahiers du Cinéma (Paris), July 1977. Interview with P. Carcassone and L. Cugny, in Cinématographe (Paris), November 1978. Interview in Stills (London), December 1984/January 1985. Interview in Inter/View (New York), February 1985. Interview in Cinéma (Paris), 25 June 1986. Interview in Nouvel Observateur (Paris), 28 September 1989. Interview in Filmihullu , no. 4, 1991. Interview in EPD Film (Frankfurt/Main), July 1992. Interview in Séquences (Haute-Ville), July-August 1997. Margulies, Ivone, Nothing Happens: Chantal Akerman's Hyperrealist Everyday , Duke University Press, 1996. Bertolina, G., "Chantal Akerman: il cinema puro," in Filmcritica (Rome), March 1976. Creveling, C., "Women Working," in Camera Obscura (Berkeley), Fall 1976. Mairesse, E., "A propos des films de Chantal Akerman: Un temps atmosphere," in Cahiers du Cinéma (Paris), October 1977. Bergstrom, Janet, in Camera Obscura (Berkeley), Fall 1978. Martin, Angela, "Chantal Akerman's Films," in Feminist Review , no. 3, 1979. Seni, N., in Frauen und Film (Berlin), September 1979. Perlmutter, Ruth, "Visible Narrative, Visible Woman," in Millenium (New York), Spring 1980. 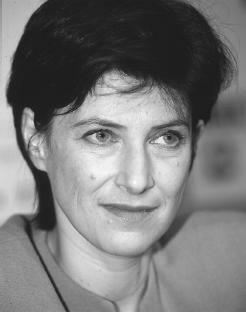 Delavaud, G., "Les chemins de Chantal Akerman," in Cahiers du Cinéma (Paris), April 1981. Philippon, A., "Fragments bruxellois/Nuit torride," in Cahiers du Cinéma (Paris), November 1982. Dossier on Akerman, in Versus (Nijmegen), no. 1, 1985. Barrowclough, S., "Chantal Akerman: Adventures in perception," in Monthly Film Bulletin (London), April 1984. Squire, C., "Toute une heure," in Screen (London), November/December 1984. Castiel, E., in 24 Images (Montreal), nos. 34/35, 1987. Paskin, Sylvia, "Waiting for the Next Shot," in Monthly Film Bulletin (London), March 1990. Bahg, P. von, "Keskusteluvourossa: Chantal Akerman," in Filmihullu , no. 4, 1991. Williams, B., "Splintered Perspectives: Counterpoint and Subjectivity in the Modernist Film Narrative," in Film Criticism , no. 2, 1991. Roberti, B., "Tradire l'immagine," Filmcritica , September/October 1991. Klerk, N. de, "Chantal Akerman," in Skrien (Amsterdam), June/July 1992. McRobbie, A., "Passionate Uncertainty," in Sight and Sound (London), September 1992. Chang, Chris, "Ruined," in Film Comment (New York), November/December 1993. Boquet, Stéphane, "Ce qui revient et ce qui arrive," in Cahiers du Cinéma (Paris), December 1995. Preziosi, Adelina, and Michele Gottardi,"Corpi di cinema/Esordienti alla carica/Il silenzio invisible," in Segnocinema (Vicenza), September-October 1997. At the age of fifteen Chantal Akerman saw Godard's Pierrot le fou and realized that filmmaking could be experimental and personal. She dropped in and out of film school and has since created short and feature films for viewers who appreciate the opportunity her works provide to think about sounds and images. Her films are often shot in real time, and in space that is part of the characters' identity. During a self-administered apprenticeship in New York (1972–73) shooting short films on very low budgets, Akerman notes that she learned much from the work of innovators Michael Snow and Stan Brakhage. She was encouraged to explore organic techniques for her personal subject matter. In her deliberately paced films there are long takes, scenes shot with stationary camera, and a play of light in relation to subjects and their space. (In Jeanne Dielman, 23 Quai du Commerce, 1080 Bruxelles , as Jeanne rides up or down in the elevator, diagonals of light from each floor cut across her face in a regular rhythm.) Her films feature vistas down long corridors, acting with characters' backs to the camera, and scenes concluded with several seconds of darkness. In Akerman films there are hotels and journeys, little conversation. Windows are opened and sounds let in, doors opened and closed; we hear a doorbell, a radio, voices on the telephone answering machine, footsteps, city noises. Each frame is carefully composed, each gesture the precise result of Akerman's directions. A frequent collaborator is her sensitive cameraperson, Babette Mangolte, who has worked with Akerman on such works as Jeanne Dielman, 23 Quai du Commerce, 1080 Bruxelles, News from Home , and Toute une nuit. Mangolte has also worked with avant guardists Yvonne Rainer, Marcel Hanoun, and Michael Snow. Plotting is minimal or non-existent in Akerman films. Old welfare clients come and go amid the impressive architecture of a once splendid hotel on New York's Upper West Side in Hotel Monterey. New York City plays its busy, noisy self for the camera as Akerman's voice on the sound track reads concerned letters from her mother in Belgium in News from Home. A young filmmaker travels to Germany to appear at a screening of her latest film, meets people who distress her, and her mother who delights her, and returns home in Les Rendezvous d'Anna. Jeanne Dielman, super-efficient housewife, earns money as a prostitute to support herself and her son. Her routine breaks down by chance, and she murders one of her customers. The films (some of which are semi-autobiographical) are not dramatic in the conventional sense, nor are they glamorized or eroticized; the excitement is inside the characters. In a film which Akerman has called a love letter to her mother, Jeanne Dielman is seen facing the steady camera as members of a cooking class might see her, and she prepares a meatloaf—in real time. Later she gives herself a thorough scrubbing in the bathtub; only her head and the motion of her arms are visible. Her straightening and arranging and smoothing are seen as a child would see and remember them. In Toute une nuit Akerman displays her precision and control as she stages the separate, audience-involving adventures of a huge cast of all ages that wanders out into Brussels byways on a hot, stormy night. In this film, reminiscent of Wim Wenders and his wanderers and Marguerite Duras's inventive sound tracks, choreography, and sense of place, Akerman continues to explore her medium using no conventional plot, few spoken words, many sounds, people who leave the frame to a lingering camera, and appealing images. A little girl asks a man to dance with her, and he does. The filmmaker's feeling for the child and the child's independence can't be mistaken.